Four comical stories about the everyday crises that arise in the lives of two siblings! Follow Tilly and Todd as they grapple with hiccups, a broken arm, chickenpox – and a dreaded attack of nits! Created with the support of literacy consultant Shirley Bickler, co-author of Book Bands for Guided Reading, these attractive books correspond to Yellow Band 3 of the Book Bands for Guided Reading, telling lively stories in short sentences combining new and familiar words. Start Reading: Tilly and Todd - Hiccups! Start Reading: Tilly and Todd - It's Not Fair! 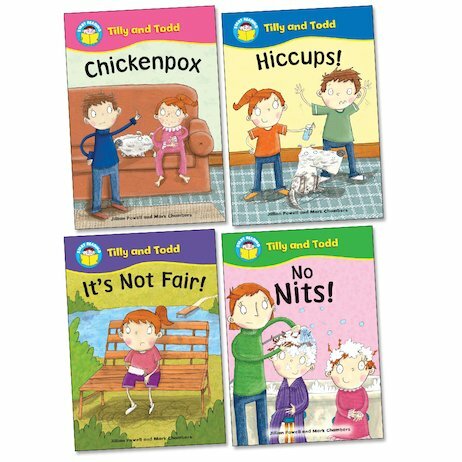 Start Reading: Tilly and Todd - No Nits!